...we have seen that the immobility of the earth was 'settled science' and 'the consensus' for excellent empirical reasons, while geomobile theories had been falsified on several grounds, most decisively on the lack of stellar parallax (which falsified the earth's revolution) and the lack of Coriolis effects (which falsified the earth's rotation). We now know that these falsifications (like all falsifications) have been falsified by what we might call the Duhem Effect. Thus, it is never evident on the face of it which of the prior assumptions -- and there will be more than two! -- has been falsified when Y fails of observation. The problem is, it's hard to know what unspoken assumptions you are assuming. The lack of stellar parallax was thought to falsify A (Earth goes round the sun) but it actually falsified B (the stars are millions of miles away). In fact, they are billions of miles away and the parallax is too small for eyesight to detect even with a 20x telescope. The stellar distance was believed to be fact, based on the brightness and diameter of stellar disks. But it turned out (in the 19th cent.!) that the "disks" were optical illusions caused by aberration and the stars differed in intrinsic brightness. But we are still here in the 17th century. In the second episode, we saw a slew of new telescopic discoveries during 1610-1611; viz., the mountains on the moon, the Medicean stars, and (more decisively) the phases of Venus. Now the first two do not demonstrate geomobility, not do they undermine geostationarity. The first indicates that the moon is not incorruptible. But this is agreed to by theology, and it undermines only Aristotelian physics. The second indicates that some heavenly bodies -- Cosmo, Franco, Carlo, and Lonzo -- circle Jupiter and not the Earth. This bothers Aristotelian physicists, but not Tychonic astronomers. Only the phases of Venus KOs Old Man Ptolemy. It was a new, modern age. Everything was changing. Who knew what might happen next? They hurt their eyes. Ow! Ow! Ow! Ow! Man, was that bright! 18 Dec. 1610. Thomas Harriot (c.51) is the first (as usual) to spot the spots on the sun with a telescope, but (also as usual) he tells only a few friends, and does not publish. Never, TOF thinks, has anyone made so many excellent and meticulous discoveries and not called a press conference. Apart from Theophrastus's and Virgil's allusions to sunspots as temporary harbingers of rain in the third and first centuries BC, a cluster of ninth-century references to the anomalous solar activity associated with the recent death of Charlemagne, and a few scattered mentions of a spotted sun in chronicles of the twelfth, thirteenth, and fifteenth centuries, there was in the Latin West neither a conceptual rubric nor anything approaching an established observational record for such phenomena. It is not surprising to find that both those who interpreted earlier reports, such as Avicenna in the eleventh century or Averroës in the twelfth, and those who observed the spots themselves, such as the Florentine poet Raffaello Gualterotti in 1604 and Johannes Kepler in 1607, assumed that planetary transits provided the explanation. Oral Culture in an Early Modern Scientific Exchange"
This should clarify a point. In science, it doesn't really matter who sees something first. What matters is who dis-covers it; that is, who removes the cover so everyone can see it. When Kepler saw a sunspot in 1607 (before telescopes) he thought he was seeing a transit of Mercury. What Harriot saw didn't matter, precisely because he never told anyone. 27 Feb. 1611. Johann Fabricius (24) and his father David (47) document sun spots, though they disagree on their nature. Are they 'moons' of the sun? Or are they 'clouds' in the sun's atmosphere? Johann had brought a telescope with him when he came home from college in Leiden in the winter of 1610. The math professor at Leiden, Rudolph Snel van Royan, was apparently the first to lecture on the telescope, and Hans probably got his telescope from him. Rudy will be the father of the delightfully-named Willibrord Snel van Royan, as in Snell’s Law of refraction. destined to be vilified by Galileo. April 1611. While Galileo is in Rome getting celebrated, Fr. Christoph Scheiner SJ (38) makes his first sightings using a telescope filtered with colored glass. Scheiner is also conducting experiments on the eyes of bulls, shaving them to translucency and looking through them. He will verify by these experiments Kepler's theory that the image forms on the retina and not in the lens itself, and will publish Oculus hoc est: Fundamentum opticum in 1619; but for some reason, the credit for the experiment will go to Descartes. Descartes, like Galileo, never gave credit to his precursors. BTW, the common notion that images formed in the lens itself probably contributed to the then-current of skepticism about telescopic images. June 1611. Johann Fabricius publishes De Maculis in Sole observatis, claiming that they are clouds in the Sun's atmosphere. His father David disagrees, going with the longstanding notion that they are planets between Mercury and the Sun. The legend of Planet Vulcan is destined for a long run. 1 Oct. 1611. 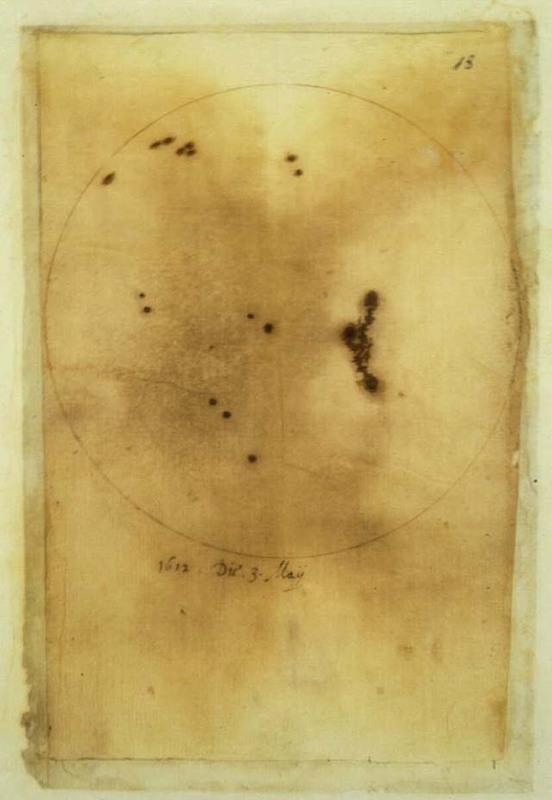 The first mention of sunspots by Galileo appears in a letter of this date. On this occasion, Galileo debates floating bodies with the philosopher Flaminio Papazzone, who argues the Aristotelian position (supported by Cdl. Gonzaga*) while Galileo takes the Archimedean position. Cdl. Barberini jumps in to support Galileo, and the two become BFF thereafter, and Barberini will become a patron of Galileo. The Grand Duke urges Galileo to publish his theories on hydrostatics, which will become the Discourse on Floating Bodies, one of his finest works of genuine physics. Oct. 1611. Scheiner begins a systematic study of sunspots using a camera obscura. This enables him to trace the images of the spots on pieces of paper, which he (and everyone else) will compare to the act of printing from a type onto paper. [The power of technology to set a metaphor for an age!] Scheiner (like David Fabricius -- and Kepler, Averroës, Avicenna, and most all predecessors) believes that the sunspots are small satellites -- inframercurial planets -- orbiting the sun. If Jupiter can have moons, why not the Sun? 21 Oct. 1611. Scheiner describes his observations in a letter to Marcus Welser (53). Welser writes his friend Johannes Faber(*) in Rome, asking if similar studies had been performed there. Faber is a member of the Accademia dei Lincei and Cesi (the founder of the academy) passes the news to Galileo . (*) Faber had been present at Cesi's dinner of 14 April 1611 when Demisiani had suggested "teleskopos"
note the social networking that tied all these people together: friends, enemies, frenemies, and Kevin Bacon. Meanwhile, Scheiner meanwhile continues his observations and sends two more letters to Welser, affirming his opinion that the sunspots are wandering stars. Welser publishes these letters under a Renaissance nom de plume, Apelles latens post tabulam, "Apelles hiding behind the canvas." This is the usual classical allusion (here, to an ancient Greek painter) without which the Renaissance pen would be struck dumb. I have been told by a friend of mine, a priest who is very fond of you, that a gang of ill-disposed men, who are envious of your virtue and merits, met at the residence of the Archbishop of Florence, and put their heads together in a mad quest for some means by which they could damage you, either with regard to the motion of the Earth or otherwise. One of them asked a preacher to state from the pulpit that you were asserting outlandish things. The priest, seeing the animosity against you, replied as a good Christian and a member of a religious order ought to do. 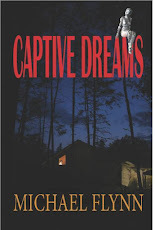 I write this that your eyes may be open to the envy and malice of these evildoers. The leader of this league is Ludovico delle Colombe, an Aristotelian physicist who deeply resents a mere mathematician speculating on physics. (In sympathies, delle Colombe might be described as neo-pagan, as his devotion to all things Greek was very Renaissance-y.) It was the rather irreligious delle Colombe who had first played the "scripture card." The "preacher" is Niccolò Lorini, a Dominican. (Because the Jesuits support Galileo, the Dominicans are somewhat ill-disposed; as for example a modern Democrat may be suspicious of a scientist who is praised by Republicans.) The "priest" Cigoli mentions is none other than the very Archbishop himself, Alessandro Marzimedici, who is favorably disposed to Galileo and who also leaks him letters of the meeting. Notice that this league, which Galileo will mock as the "Pigeon League" -- colomb means "dove" in Italian -- is less concerned with the motions of the earth than with finding some way, any way, of knocking Galileo off his pedestal. Delle Colombe is angry over Galileo's assault on Aristotelianism. Copernicanism is a handy stick. If not that, then the floating bodies. Or something. 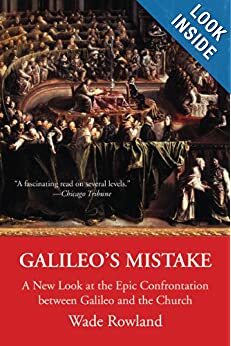 Example of Galilean wit: Concerning delle Colombe, Galileo remarked that Aristotle made many blunders, "Though neither so many nor so silly as does this author every time he opens his mouth on the subject." He never could resist a good zinger, and must have been the hit of many salons and dinner parties, but "his caustic tongue and acid pen made him many a life-long enemy and even converted supportive colleagues into vindictive foes." He is in the process of doing that with Scheiner. Jan. 1612. Galileo receives a copy of Scheiner's tract and writes a letter to Welser in response, stating that he does not dare to reply without making some further observations of his own because he fears that any minor error on his part would be seized upon "by the enemies of truth whose number was infinite." However, he proposes that the sunspots are not planets but are actually on or very near the surface. 6 Feb. 1612. Old Christoph Clavius, who had been project team leader for Project Gregorian Calendar and who had overseen the confirmation of Galileo's telescopic observations, goes off to that great observatory in the sky. He had been Galileo's first booster and had remained a friend, helping Galileo secure a chair at Pisa. Fr. Kirchner will later say (as reported in a letter from de Peiresc to Gassendi, 6 Sept. 1633) that Fr. Clavius himself did not really disapprove of the opinions of Copernicus and was not far from it himself. In his final revision of his textbook, in which he included Galileo's discoveries, he advised readers to read The Starry Message, concluding: "Since things are thus, astronomers ought to consider how the celestial orbs may be arranged in order to save these appearances." May 1612. Galileo responds to Apelles by sending a letter in Tuscan to Welser, which the German must translate into Latin (or German, TOF is unclear in this), delaying its transit. In the closing paragraphs, Galileo mentions in passing that his student, Fr. Benedetto Castelli has suggests using a camera obscuro, which will make it possible to observe the sun during the day, and make continuous daily records of the spots. "and tell him ['Apelles'] that in a few days I shall send him some observations and diagrams of sunspots which are absolutely exact both as to their shape and their variation of position from day to day, drawn without a hairsbreadth of error in a very elegant manner discovered by a pupil of mine." He probably does not know that Scheiner also has a camera obscura and has already been making such observations. The term camera obscura had been coined by Kepler, but the principle had been known to Aristotle and was used by Renaissance artists to project scenes onto canvases for tracing. It's astonishing that Galileo had not known of this before Castelli brought it up. Scheiner continues his observations and sends three more letters to Welser entitled A more accurate discourse, in which he disputes Galileo's priority in noticing the sunspots. and brown #2 will impact on the air conditioner. Castelli will also figure in that brouhaha. More later. 30 Jun. 1612. Prince Cesi had earlier said he would gladly accept Copernicanism if it removed the eccentrics and epicycles. Galileo writes back defending eccentrics and epicycles. "If anyone wants to deny the epicycles, he must deny the paths of the satellites of Jupiter... Excentrics exist, for what else is the path of Mars according to the best observations?" De Santillana observes of this: "The eccentricity of Mars is present in his thoughts, the ideas of Kepler are being discussed among his friends, but nothing happens." -- de Santillana, p. 36 n.
July 1612. Galileo writes to Cardinal Carlo Conti about sunspots and the questions raised by them. In reply, Conti "states that Scripture did not support the Aristotelian theory of the incorruptibility of the heavens but that, on the contrary, the common opinion of the Fathers of the Church was that the heavens were corruptible" (Fantoli, 1996: 141). Conti further remarks that the motion of the Earth could be accommodated with the Biblical passages if it was supposed that Scripture was written according to the understanding of ordinary persons, not as consisting in exact astronomical information. This, he added, "should not be admitted unless it is really necessary." Keep an eye on those further remarks. Aug. 1612. Galileo writes his second letter on sunspots to Welser. He demonstrates by careful observation and mathematical analysis that the sunspots must be on the surface of the sun (an idea which Johann Fabricius had already proposed). Pace Cdl.Conti, Galileo notes that the incorruptibility of the heavens is "not only false but repugnant to those truths of Sacred Scripture about which there could be no doubt." Sep. 1612. Scheiner's second tract on sunspots, consisting of another three letters, is published by Welser: A more accurate discussion of sunspots and the stars which move around Jupiter, again under the pseudonym of Apelles. 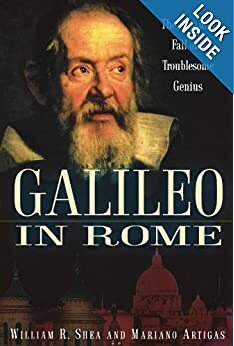 It seems to completely ignore Galileo's first two letters, and nothing bugs Galileo more than being ignored, unless it is someone else claiming a telescopic discovery. What has happened, of course, is that Scheiner and Galileo have "cross posted" due to the delay in Welser's translations and printing. Scheiner's second tract had been prepared before he had seen Galileo's arguments, but Galileo received the booklet a month after. Fall 1612. Galileo's friends, including Cesi, insist that he respond in print to the question of priority and Galileo resolves to flame Apelles, whom he now knows to be a Jesuit. Because Apelles seems to have ignored all his proofs, Galileo writes with withering sarcasm and condescension and addresses gratuitous insults against him, some of which will even be removed by the Lincei themselves. But Galileo ponders how he can slime Scheiner without angering Welser. Indeed, Welser declines to publish Galileo's letters as-is, and the Lincean Academy decides to publish Galileo's letters on sunspots. "Wish I was a Grand Duchess"
(*) title neep. Mama Christina retained the title of Grand Duchess after her son succeeded to the throne, and his wife settled betimes for her native Austrian title of Archduchess until Christina would die. Whenever that was going to be. 1637. Long way to go yet. Poor Mary died first, in 1631. Dec. 1612. In his third and final letter, Galileo tackles Scheiner's arguments and rejects the latter's attempts to demonstrate the Tychonian system. Once the translation buffer clears and Scheiner sees Galileo's observations and the math, he is convinced that the Tuscan had been right, but it's now too late. The Great Galileo-Scheiner Flame War runs actively through 1613 and passive-aggressively ever after. Galileo has quite unnecessarily made a lifelong enemy out of someone previously an admirer and potential ally. Ironically, in the bickering over priority, neither man seemed aware that Fabricius had beaten them both into print, and none of them (including the Fabricii) knew of Harriot’s even earlier unpublished notes! March 1613. Galileo's History and Demonstrations about Sunspots and their Properties, containing his three letters to Apelles via Welser, is published by the Lincean Academy in Rome. About half the copies include reprints of Scheiner's two tracts. The preface by Anastasio de Fillis, the librarian of the Lynceans, attacks Scheiner and claims priority for Galileo. One web site states that Galileo himself was wary of this addition and the harm it could do to his standing with the Jesuits. Unfortunately by this time, the two principles are irrevocably embittered. This will come back to bite Galileo in 1633. In 1613, Galileo will abandon telescopic astronomy, but Scheiner will go on to make an extensive telescopic study of the sun, develop the sunspot notation still in use today, and note the differential rotation of the sun’s hemispheres which is now believed to be the genesis of sunspots. This will be published in 1630 in the Rosa Ursina, the definitive 17th cent. book on sunspots: a work of lasting mathematical beauty -- and dull, impenetrable prose. Of course, it attacks Galileo, too. Sigh. ITOFsHO, the significance of the sunspots for the geomobile hypothesis is not the Sun's maculate nature, but the discovery that the Sun rotates on his axis. This provides support for (but not proof of) the notion that the Earth just maybe might do the same. The significance of the Letters is that Galileo came out foursquare as an advocate for Copernicanism. The censors were not interested in that. It's a good thing Galileo doesn't have any enemies. Or that Tommy Caccini can't resist a pun. Part IV coming up later. field of view of a 20x Galilean telescope. 1613-1617. Based on analyses published by Kepler in 1611 (Dioptrice), Scheiner will design and build the first modern refracting telescope. This uses two convex lenses instead of Galileo's convex-concave arrangement. This results in an inverted image, but a dramatically enlarged field of view. Since the field of view decreases as the power increases, this innovation allows telescopes of increasing power. Galilean telescopes would be nearly useless at higher powers. Of course, Galileo will trash-talk him over this telescopic advance, too. #3. Johannes van Heeck (24), physician (the only one with a college degree), also known as vanEyk, van Heyk, Heeckius, etc. He was at the dinner party when the telescope was named. #4. Anastasio De Fillis (26), polymath. He was editor of Letters on Sunspots. At first the members lived communally (almost monastically) in Cesi's house, where he provided books and lab equipment at his own expense. However, Cesi's dad thought they were forming a cult and kicked the guys out of the house. They kept in touch afterward by correspondence. Van Heeck in particular wanders all over Europe doing botanical observations and sending reports back to Rome. Cesi, despite his youth, is a natural leader and has an uncanny ability to navigate through Machiavellian Italy. Whatever you need, he knows a guy. It will be Galileo's great misfortune that he dies before the Dialogue is written. #5. Giambattista della Porta (75), polymath and occultist, in 1610. He had started his own academy in Naples, but it was a bit too occult for the authorities and was disbanded under suspicion of sorcery. #6. Galileo Galilei (47), mathematician, in 1611. #7. Johann Schreck SJ (35), botanist, also in 1611. He was also at that famous dinner party. He will heigh off to China with a Keplerian telescope, which he will introduce to the Chinese. Johann Faber has also been called a member, but TOF does not know when he was inducted. The academy dissolved in 1630 when Cesi died. It was revived in its currently well known form of the Pontifical Academy of Sciences by the Vatican, Pope Pius IX in 1847. Christie, Thony (2013) He didn’t publish and so he perished (historically). De Santillana, Giorgio. 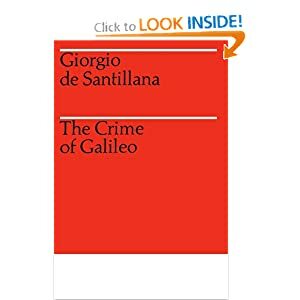 The Crime of Galileo. Chicago: University of Chicago Press, 1955. The Galilean Library. Non-Intellectual Contexts. Rowland, Wade. Galileo's Mistake. New York: Arcade Publishing, 2003. Sant, Joseph (2012). Jesuits and the Early Telescope:Scheiner and Grienberger. Shea, William R. & Mariano Artigas. Galileo in Rome. Oxford: Oxford University Press, 2003. ----------------- The Galileo Affair. A shorter summary of the Shea/Artigas book. This is great, thanks. This will be the second one of your series that I will inflict on my children. For their own good of course. A similar but probably shorter project would be to do a similar fact based and documented description of Mendel's work. Next to MLK, he's probably the man whose religious convictions are most routinely and studiously unmentioned. There's a bit on Mendel here: De Evolutione Evolutionis. Loving these, Michael. Obviously, Thomas "No Plublish" Harriot had an INTP personality (Myers-Briggs). Typical of the breed -- satisfies his own curiousity, doesn't much care who knows or not. "When Ptolemy was ptossed" - I like it. Internet LOL of the day! but the direction of the rotation changed during the year. We know this is because the Earth orbits the sun. How was this discussed back then? "Galileo kept looking for the knock-out punch. At first he thought the path of sunspots proved the Earth’s motion. They traced a straight line across the Sun’s face only during Earth’s solstices. If the Earth circled a Sun inclined to the ecliptic, this semi-annual cycle made sense! But in 1629, Fr. Scheiner accounted for sunspot paths more accurately and deduced the Sun’s inclination while retaining a stationary Earth. It made sense the Tychonic way, too." I don't have Scheiner's demonstration. But keep in mind that the Tychonic and Copernican systems were mathematically equivalent. differing only in the origin point of their resp. coordinate systems. Anything that could be calculated from the one could be calculated from the other. Galileo had a scathing tongue he did not know how to hold. Heh. He was from Tuscany. "In fact, they [the stars] are billions of miles away". Um, no. Neptune is billions of miles away. Even the nearest star is about 25 *trillion* miles away. Yes, that comment was a little tongue-in-cheek. Where in the hell has this site been? Great work! Thank you for this series! Galileo continues to come up in conversation, and I had read a little, including Dava Sobel's "Galileo's Daughter". You help me to pull together some threads I had forgotten.